A while back, whilst on my travels through London I noticed demolition work going on around Denmark Street. It appeared that developers had already knocked down a fair bit on Earmshaw Street, and behind the buildings on Denmark Street too. Even though ‘development’ is becoming ever more commonplace I have to say it was all a bit of a shock. ‘Tin Pan Alley’ has resided in London’s Denmark Street since 1906. Being equidistant between the jazz cafes of Soho, and the big lights of Theatre-land in Covent Garden it was home to songwriters, music venues, recording studios, rehearsal spaces, demo studios and music instruments shops, as well as being the birthplace of British Silent Cinema. London’s Tin Pan Alley remains unparalleled. On investigation many of the streets buildings will survive though most of the music shops and venues will not. It will be a shadow if itself. I decided then to paint Denmark Street before it all disappeared for good. 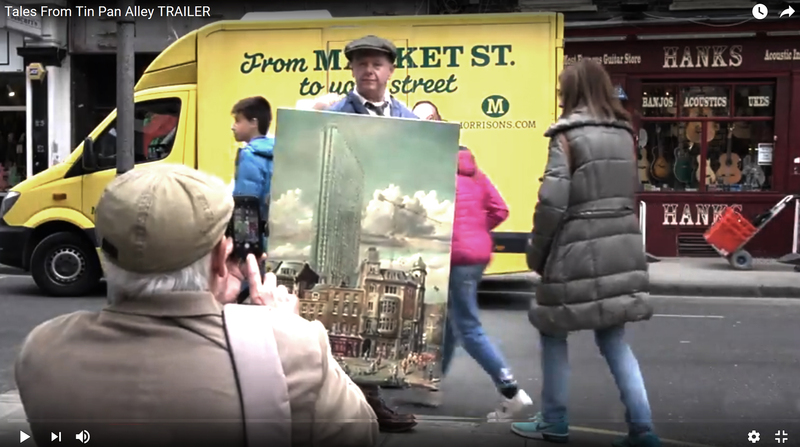 Once the painting was finished I was approached by the author and film maker Henry Scott-Irvine. He explained that he was making a documentary film about Denmark Street and asked if he could use my artwork for the poster to. I was happy to oblige. One of the greatest inspirations for young artists is the idea of doing a film poster. When I grew up in the 70’s almost all film posters were painted, and as a working class kid it was probably first art I experienced. Some have since become iconic images, who can forget the shock of the poster for JAWS? That malevolent mouth gaping open just moments prior to devouring the unseeing victim. 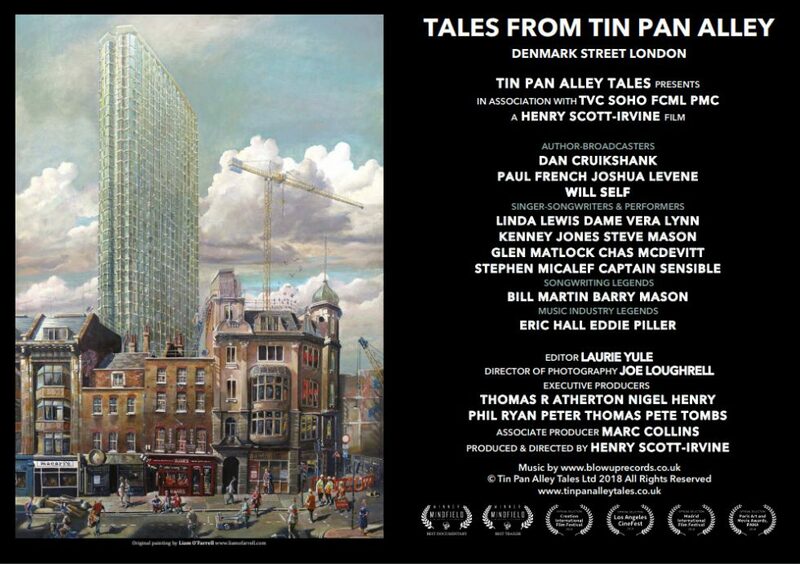 Tales From Tin Pan Alley is told by key people who worked in London’s Denmark Street. 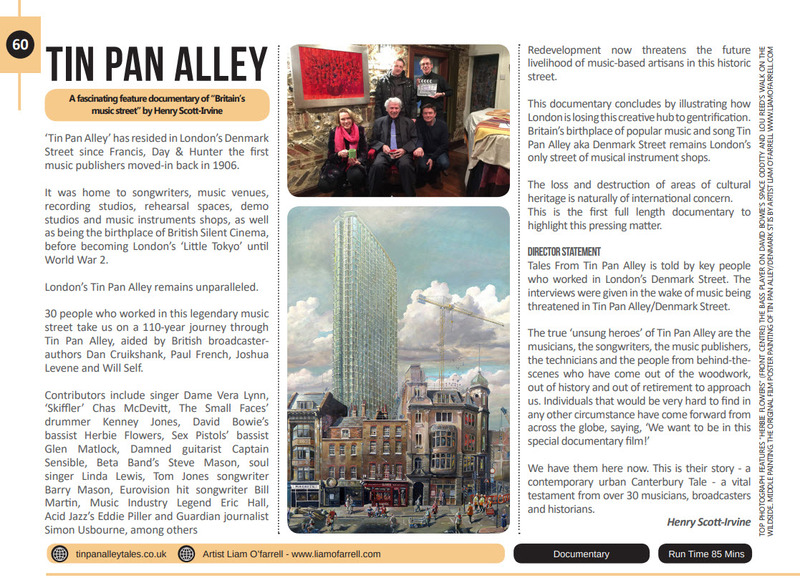 The interviews were given in the wake of music being threatened in Tin Pan Alley/Denmark Street. We have them here now. This is their story – a contemporary urban Canterbury Tale – a vital testament from over 30 musicians, broadcasters and historians. Who is in Tales From Tin Pan Alley? 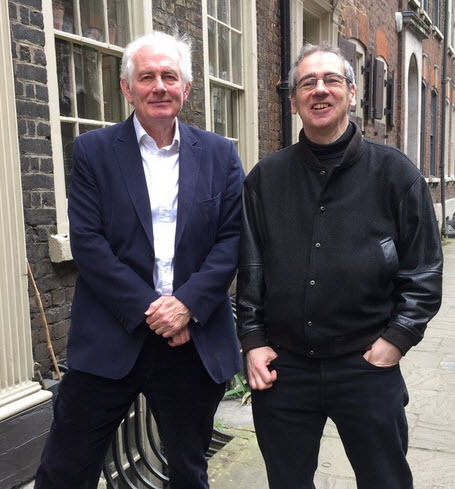 30 people who worked in this legendary music street take us on a 110-year journey through Tin Pan Alley, aided by British broadcaster authors. Where can you see Tales From Tin Pan Alley? It was really great meeting Henry Scott-Irvine and a few of the others involved in the film. It was a privilege to take part and contribute.